Rockwall Metal Roofing also Specializes in Gutter Installation and Repair! Gutters help Reduce Erosion, Prevents Leaks, and Reduces Water Exposure to painted or stained areas. Gutters should be cleaned at least twice a year. During the cleaning process, one should check for any needed repairs. If your Gutters need Repairing, Rockwall Metal Roofing is your best bet! Installing an addition to your home? Gutters are a must! Give us a CALL and we can come give you your No Obligation, FREE Estimate! We can work with you and your budget! Bought a home without Gutters? No worries, we can help there too! With our professional and hard working Contractors, we are sure to have Gutters on your home in no time! Rockwall Metal Roofing uses only the BEST Gutter Supplies! You can rest easy knowing and trusting that your Gutters are of the BEST Quality! We treat your home like it is our own home, with the utmost care and respect! 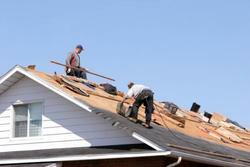 FREE Estimates on ALL ROOFING SERVICES!